Built by the Constructions Mécaniques de Normandie shipyard (CMN) in Cherbourg, the "Nauta-Peterson 105'", as the name implies, is the result of a collaboration between Nauta Design (for the general concept and the interior/exterior design) and Doug Peterson (who designed the waterlines and appendices). Dominique Jamard from Castlemain France was responsible for project management and general co-ordination of the work. The "Nauta-Peterson 105'" has a hull and deck of aluminium, while composite material was used for the deckhouse and cockpit. CAD/CAM technology, including laser cutting of the plates, was used to build this sloop, resulting in a finished product of very high quality. The deck layout is clean and sporty, with a streamlined deckhouse extending towards the stern. The guest cockpit amidships can be set up with a collapsible table. The second cockpit is far astern, separated from the first cockpit by an area designed for the cushioned sun area and is equipped with a double helm and the navigation instrumentation. The interior, designed in collaboration with Arnaldo Tranti Design, has been laid out so as to distribute the spaces optimally. 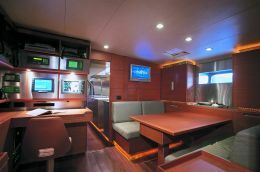 The area dedicated to the owner and guests extends forward from the central area while the crew quarters are further astern. The owner's suite is forwardmost and boasts a double bath. Moving astern, we find the two guest cabins, both with private bath (one a VIP cabin and the other with three beds). 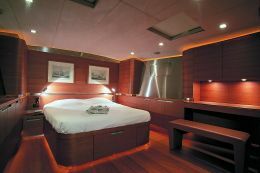 Amidships, the common area, consisting of a dining area to starboard and a relaxation area opposite; further astern, we find a guest cabin with bath and three beds and the large galley equipped with an island. Next comes the crew quarters, consisting of a dining area, a VIP cabin and two cabins with bunks, for a total of six beds. The numerous accessories for relaxation, both in the cabins and in the saloon and dinette, make this yacht ideal for long cruises. For further information: Nauta Yachts, Via Mascheroni 19, 20145 Milan; tel. 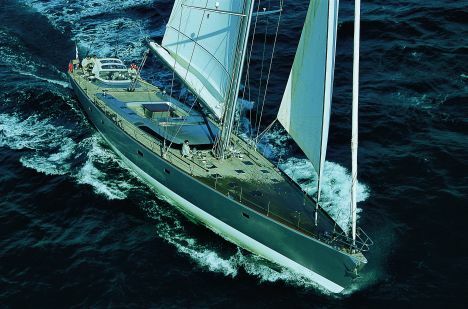 : +39 02 4814317; fax: +39 02 4986792; website: www.nautayachts.com; e-mail: nautayachts@nautayachts.com.